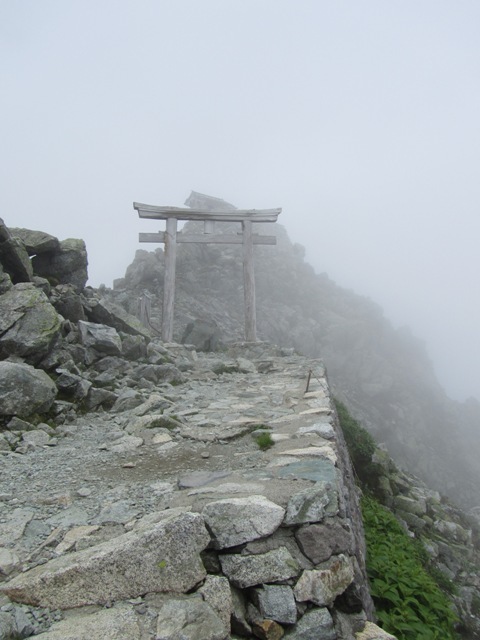 Having hiked Fuji-san two years ago, and Hakusan last year, I completed the triad of holy mountains in Japan a few weeks ago with Tateyama in Toyama prefecture. We climbed it on Marine Day, a national holiday, but strangely enough, a few times I was reminded of the sea near my hometown as I was climbing. I wasn’t sure if the hike would go ahead because my friends Mauricio and Kacie who had organised the trip, had climbed Fuji the week before and had a similar experience to mine, so I thought that might have put them off, but they wanted to complete the three holy mountains before they left Japan in a few weeks, so they rallied and we set off from Kanazawa station bright and early at 5:59 a.m. The journey to the starting point was fairly straightforward despite taking four hours. We took a JR train to Toyama city, transferred to a private rail train to Tateyama station and then a cable car and a bus to the trail. 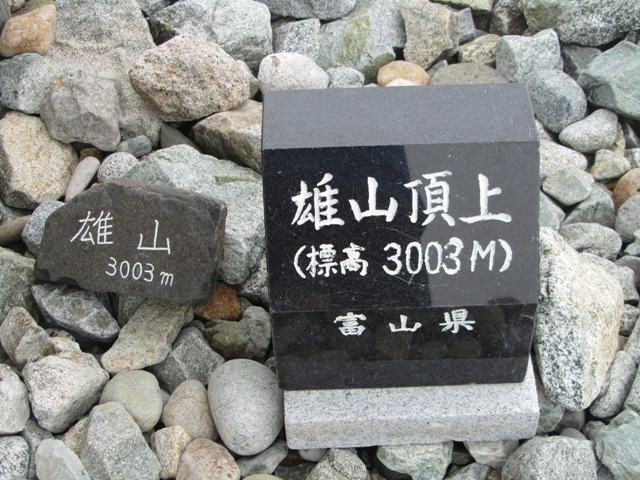 The total return cost was about ¥9,000. It was a pleasant commute though because the trains brought us through the countryside of Toyama prefecture and the bus took us through the foothills of the Japanese alps. 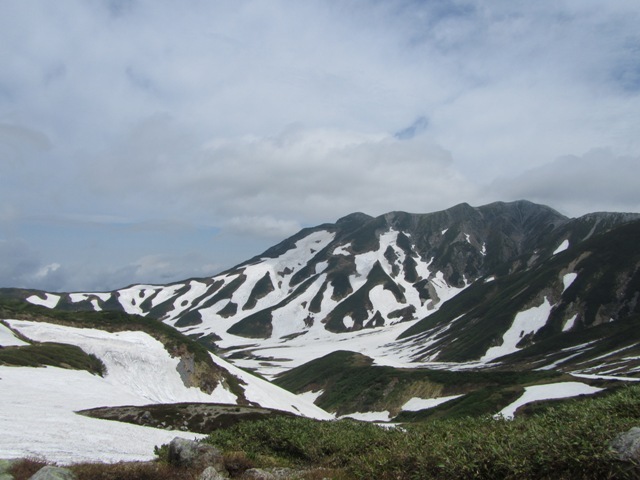 Tateyama is most famous for the Tateyama-Kurobe Alpine Route from Toyama to Nagano through the mountains. It’s crossed using a variety of transport though it also offers many hiking opportunities during the warmer months. 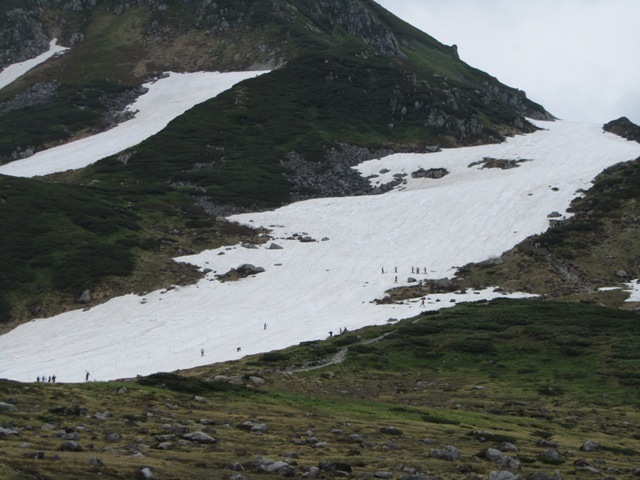 That was not our plan though because we just wanted to climb to the summit of Tateyama. 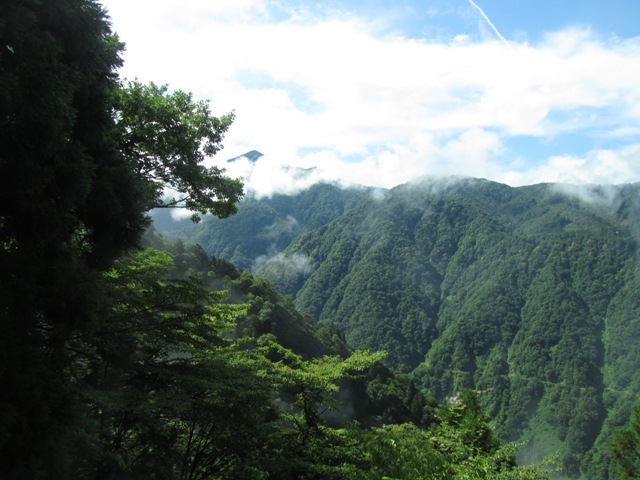 The climb was very different to Fuji or Hakusan, both in terms of terrain and time of year. I climbed Fuji in late August at night, and it was just a hard slog up crude stone steps, and slipping on volcanic rubble on the way down. The mountain itself was not pretty when the sun came up. 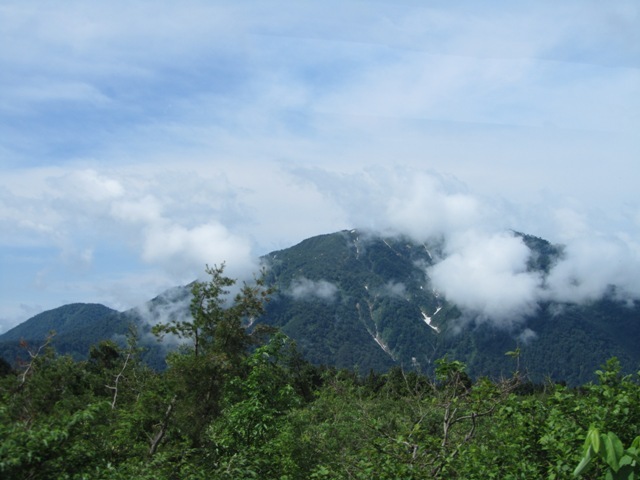 I climbed Hakusan in September and it was the most beautiful mountain because there was so many different kinds of scenery – from verdant hillsides to rocky slopes. But, like going up a few hundred meters-worth of stairs, it was tough on my knees and my lungs. 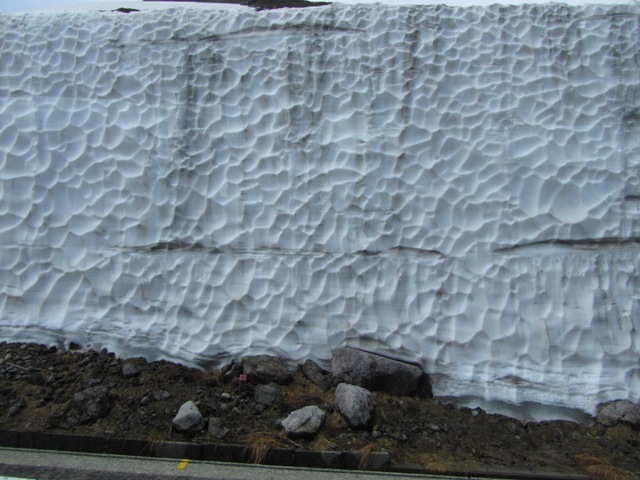 It’s hard to get the scale, but that wall of snow was taller than me. At the bottom, we were unsure of the path at first because there are a range of mountains of similar size around it, so we didn’t know which peak we would be ascending. We had seen snow on the mountains as we drove on the bus, but we didn’t expect to have to trek across it! 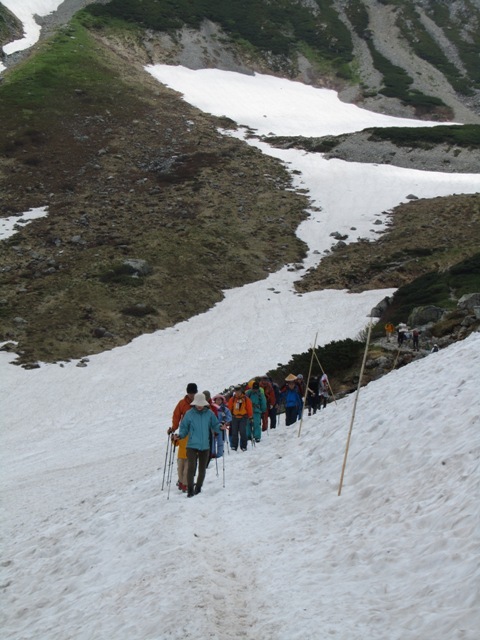 Even though the snowy paths weren’t very steep, they were slippy and the mountain side fell away quite sharply, so a wrong move could have resulted in a well cushioned slide and a difficult trudge back up. 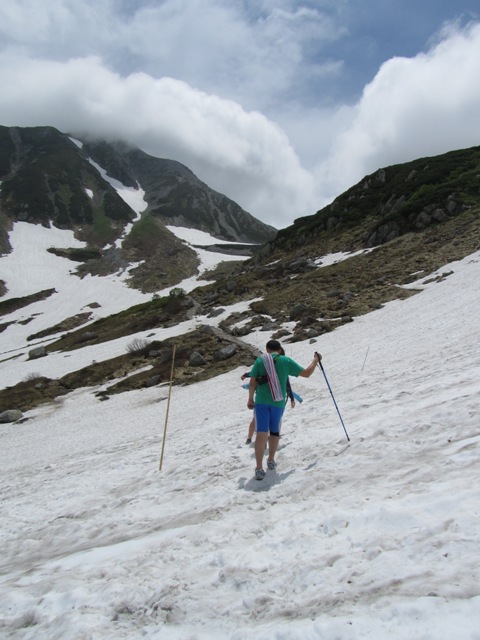 We had all worn shorts because we had thought it would be like the sunny hike up Hakusan, but luckily we had brought jackets as well because it was a bit chilly with the wind. We warmed up fast enough when we were climbing though. That didn’t stop every person we met from exclaiming “Aren’t you cold?!”. Japanese people never wear shorts for hiking. Actually they sometimes do, but they always wear leggings under them. The Japanese are unmatched when it comes to functional fashionable outdoor wear. 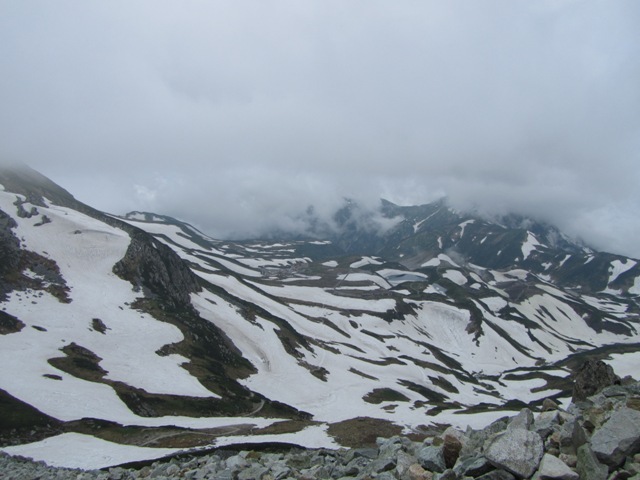 There were rock-paved paths up to the saddle between the peaks of Tateyama and Mt Ryuo that weren’t difficult to walk up but the exertion did take my breath away. Up to the peak was very different. It was a vertical rocky climb with a faint trail that was marked by the occasional faded red arrow. I was the leader for this part of the climb and at one point I lost the trail and ended up leading the others up a series of big rocks that you had to use all four limbs to climb. The others didn’t thank me for it but I thought it was fun. It reminded me of climbing over the sharp rocks at the seaside in my home town. These bundles at the rest stop wouldn’t have looked out of place at a harbour. Looking back down at the rest stop. As we neared the summit we entered the bank of cloud that was lying over it. Occasionally it would part and we could see exactly how steep the mountain was. When we got to the top we had our lunch, got a stamp at the shop and I bought a bell. 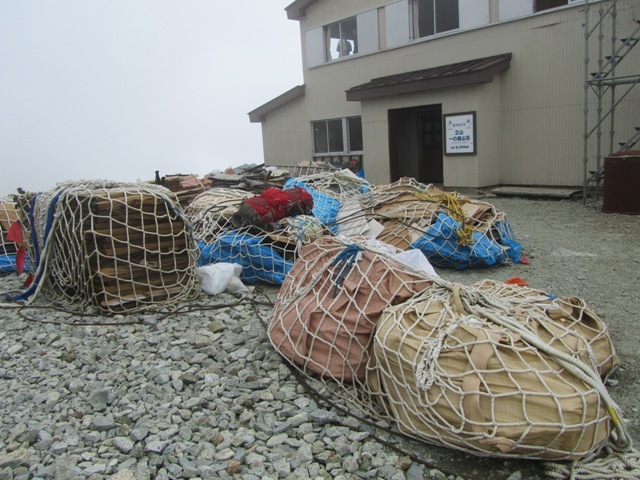 Then we paid ¥500 to go up to the tip of the peak where there was a shrine. 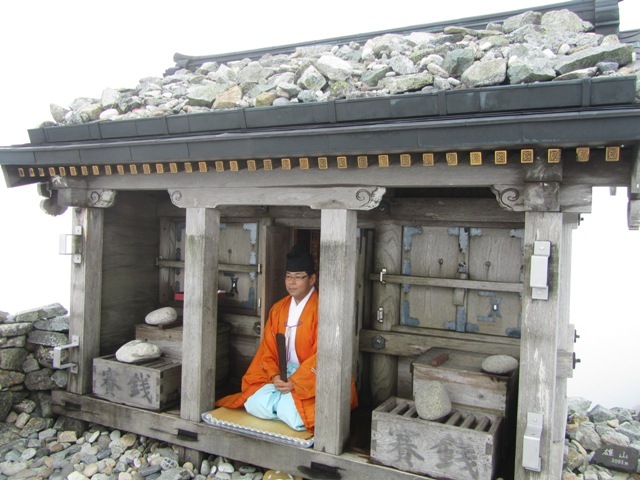 The priest welcomed us, spoke about the holiness of Tateyama, chanted and beat a little drum. We also got to drink some holy sake. 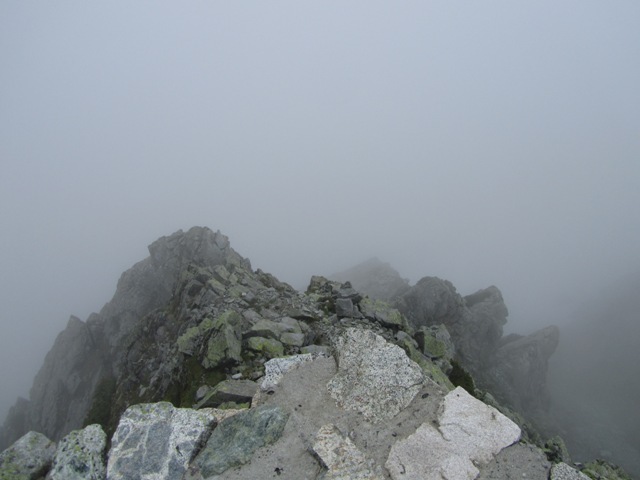 Apparently the views from the summit are spectacular, but we missed them because if the mist. Sometimes you can see all the way to Fuji. But I quite liked the misty peak, it was very mysterious and it felt like we were travelling to another world. Forgive the obscure reference, but it reminded me of the gateway to the Ninth Underworld in Grim Fandango. That’s the view looking vertically down from the summit. We raced down the mountain like goats as the descent wasn’t too bad, it was steep but there wasn’t a lot of scree so we were able to keep our balance. My knees were pretty sore after it though. We finished earlier than we had expected so we got on the 3 o’clock bus and were back in Kanazawa before it got dark and celebrated with a huge Chinese dinner.